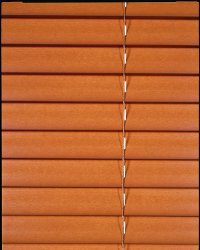 Signature Faux Wood blinds give our customers the advantage of the look of real wood blinds at reasonable prices. 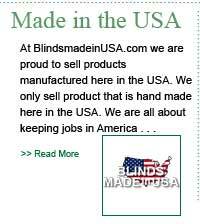 Like our top selling Premium Faux Wood Blinds, All Signature Faux Wood Blinds are 100% Fabricated in the United States ensuring jobs stay here in the U.S.
We guarantee you will be completely satisfied with our Signature Faux Wood Blinds, they are made from the highest quality polyvinyl materials to resist cracking and warpage. 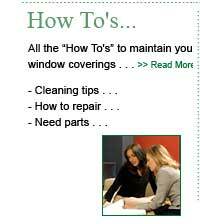 They are easily cleaned and have U. V. Inhibitors to protect the finish for the lifetime of the blinds. Faux Wood Blinds look great in any room, you will not be disappointed. 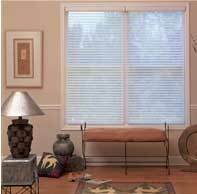 All blinds come standard with 3 1/2" Vogue and Trapezoid bottom rail. Traditional routed slats can be upgraded to routeless/privacy option or decorative cloth tapes. The routeless/privacy option eliminates cord holes in the slats, preventing annoying "sunspots" and ensuring privacy. Decorative cloth tapes allows to you furthure customize this product to match your rooms decor. Durable 2 x 2 color coordinated steel head rail. Premium cord tilt is considered the standard tilt option in the window covering industry as it is a heavy duty tilt system. Wand tilt control also available. Standad child safety installation kits, safety cord stops and crash proof cord locks. 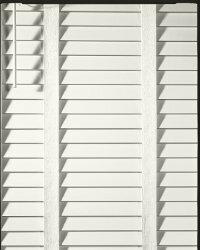 Like any wood furnishings, wood blinds should be dusted regularly to keep them looking new. Use a soft, clean cloth, chemically treated dust cloth or dusting mitt. 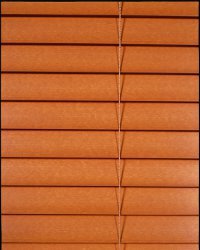 Blinds may also be cleaned by vacuuming them with a brush attachment of a vacuum cleaner or by wiping with a soft, damp rag. 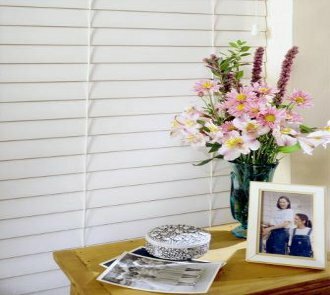 Our manufacturer warrants that Faux wood blinds from this collection will be free from defects in materials and workmanship for as long as original purchasor owns the products. See additional information on warranty page. For added privacy we offer the routeless/privacy option. Slats do not have the traditional route holes. They have small knotches at the back of each slat. These knotches allow the slats to rest on the braided ladders. This elimates "sunspot" due to the traditional route holes found in slats. 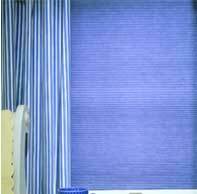 Slats are able to be removed easily from blind for cleaning. However because the slats only rest on top of the ladders, they tend to shift to the left and right very easily during operation of the blind. When this happens you simply realign the slats with your hands. Another great option to customize your blinds is cloth tape. This allows you to choose a 1 1/2" wide cloth tape that will be used in conjunction with braided ladder to help support the slats. The cloth tapes come in a variety of colors to further enhance the decor of your home. Faux Wood Blinds - Measuring and Installation. 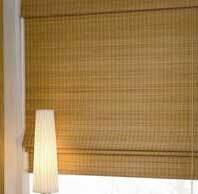 Inside Mount Allowance-As with all product, factory will take standard deduction off of width for all blinds ordered as inside mount. This deduction is ordered width minus 1/2". No deductions will be taken off of length. 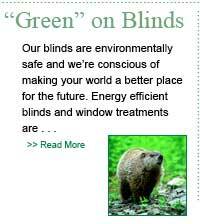 Outside Mount Allowance- No deductions will be taken off of width or length for blinds ordered as outside mount. All valances for blinds ordered as inside mount will be cut straight on both ends and will be 1/8" less then ordered width unless otherwise specified. 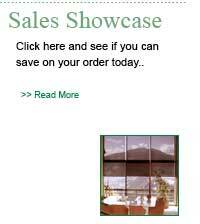 If you need outside mount valances on your inside mount blinds or have any other valance instructions please specify on special comments on the order screen. All valances for ordered as outside mount will have mitered corners with 2 5/8" returns. The valances themselves will be approximately 1/2 wider then the blinds ordered width to fit over headrail and brackets. 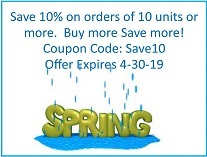 If you need special returns sizes or special instructions for your valances please list this under the order comments section of the order screen. All special valance comments must be made at time of order. Replacement valances due to consumer not specifying instructions at time of order may result in a charge if a new valance needs to be supplied. Minimum Casement Depth for bracket attachment 1 1/2"
Minimum Casement Depth for fully recessed blind and valance is 3"
Minimum flat mounting surface height 1 3/4"
Recommended width overlap per side 1 1/2"
Minimum and maximum widths are dependant upon added options. See also control options as miniumum width will effect control options. 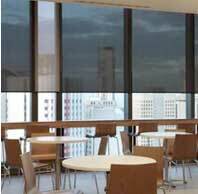 Minimum net width of blind with decorative tapes 7 1/2"
Maximum ordered width of 72"
Maximum ordered height 126" This is width dependant. Minimum overall net width of 2 on 1 12 1/2"
Minimum overall net width of 3 on 1 18 1/2"
Standard control options are Tilt on left side and Lift on right side. Industry standard tilt control is cord because it is a heavy duty system that allows tighter closing of slats. Wands are an option if you prefer. You can specify which side you want your tilt and lift controls on, although some options are dependent when smaller width are ordered. Blinds less then 10 1/2" width (net) must will be center tilt only. There will not be a lift control. Blinds less then 22 1/2" width (net) must have split controls. Example Tilt on left and Lift on right or Lift on left and Tilt on right.